Nai Dilli happened after more than two years and it was one of the most awaited events in the blogging community here especially since this is also the last blogger meet of the decade! It was cold as hell and the week running up the meet was one hell of a party! This IndiBlogger meet was an initiative amongst many others where IndiBlogger gives back. Every year due to the cold wave many homeless die due for lack of adequate clothing. Blanket Of Relief, a unique initiative IndiBlogger partnered with for the cause raised more than INR 2 lac in a short span with help coming from all circles. BASSFoundation also held a concert at Zook; a popular pub in Saket as a charity fund raiser. Thanks to their diligence and efforts, the homeless will have a warmer winter this year. Such initiatives reiterate our commitment to give back to the society. We wish the team behind Blanket Of Relief all the best; and hope they carry this forward for many more years. 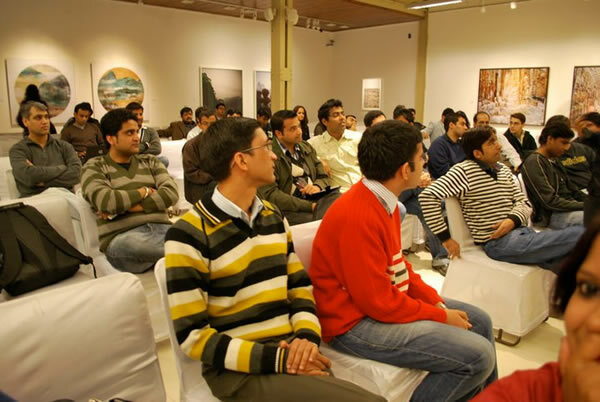 Religare Arts Gallery was a very cordial venue which was able to seat more than 100 people in the hall very comfortably. Had it not been for their support, like Anoop Johnson exclaimed during the blogger meet; we would probably have had to do this in the basement of Palika Bazaar. The Religare Arts Initiative was established on the founding vision of creating a 360 degree platform for arts, to provide contemporary art a larger integrated voice and make art a more transparent, relevant and effective force in the society. Mr. Mukesh Panika, Director of Religare Art also shared with everyone their commitment to the blogging community in India. Mydala.com one of India’s leading group buying websites was also one of our partners for the event. Every blogger got a 500 rupee voucher as well which can be freely redeemed on the website. A quiz by myDala set the mood right with questions like “Why did he throw the watch out of the window!” It was highly interactive and the blogger who gave right or most interesting answers were given hampers from Cinnabon; the Gift Hamper partner. GuitarMonk one of the social partners is one of the leading music brands in India comprising a label, publishing and gifting as well. The introductions set the mood right; with everyone getting their chance to introduce themselves to the community. There were working professionals, mothers, students and bloggers from all walks of life like any other blogger meet. One of the firsts for IndiBlogger – #IndiDelhi was trending on twitter for close to 6 hours during the blogger meet; thanks to all bloggers who were part of this to spread the joy of blogging to the entire country! The Live and Let Comment; one of IndiBlogger’s trademark activities had bloggers become 16 again, like Purba Ray later excitedly mentioned when the session was on. We threw in a dash of creativity this time with bloggers having to draw each other’s caricatures on the sheet. Anand, an artist from the gallery also drew many caricatures for bloggers. The meet also saw the launch of an exclusive contest for Delhi Bloggers – The Bad Fashion Days contest. Brandmile, our fashion partner at the meet also announced a contest where one who brings the maximum friends on the brand mile network would win an iPad! Brandmile is a members only exclusive private shopping club in India. Cheers to the hospitality extended by Delhi Bloggers, Dilli ki Sardi, the butter chicken, the happy hours and blogging! Previous story Last chance to catch “Yours Digitally, Madras”!